Our classic rope of the pro line in the second generation: lightwight, compact and perfect handling. By using state-of-the art yarns, we can reduce the diameter without comprising the technical standards. bluesign-productbluesign® productThe bluesign® standard is the world's most stringent textile standard for environmental protection, consumer protection and occupational safety. All environmental aspects of production are evaluated at the screening: water and air emissions, noise levels, energy and material use, as well as working conditions related to dangerous materials. A "bluesign® product" label means that at least 95% of all product components have been bluesign® certified. EinfachseilSingle ropes are the most common type of climbing rope. They are the classic climbing rope, as it were. 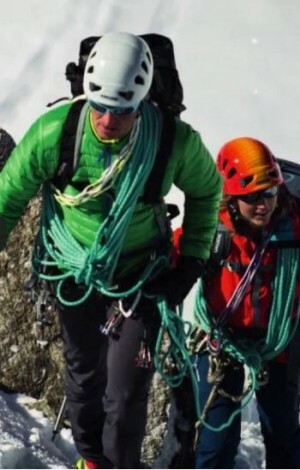 They are classic sport climbing ropes, for both outdoor and indoor use, and are also used for alpine climbing, mountaineering and by big wall climbers. One of their main advantages is their simple and uncomplicated handling. EDELRID manufactures single ropes in diameters from 8.6 mm to 10.5 mm. They weigh in at 51 to 69 grams per metre. Single ropes with a thicker diameter are generally stronger and can withstand a greater number of falls. However thicker also means heavier. For intensive use, such as working routes or top-roping, there are robust single ropes with a higher sheath proportion.